Low Library, completed in 1897, was intended to dominate Columbia’s Morningside Heights campus. It continues to. At the turn of the century, Low housed the library; today it houses the central administration. 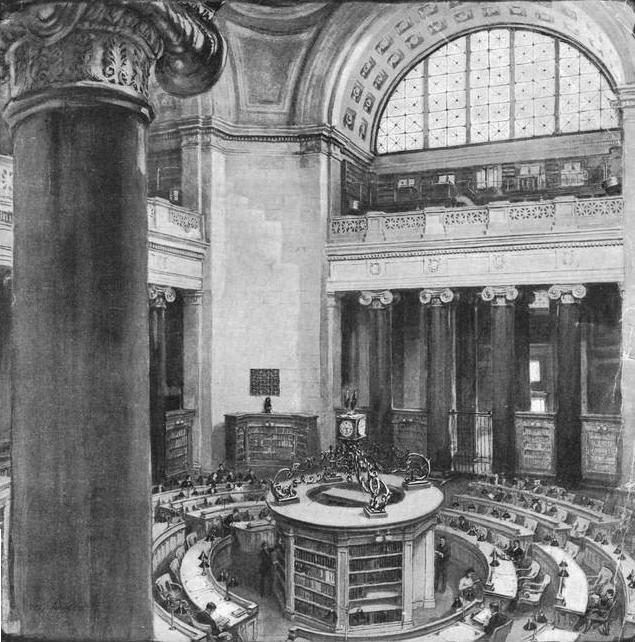 Butler Library, which cost $4 million of Edward Harkness’s Standard Oil dollars*, replaced Low as Columbia’s library. Completed in 1934, it was known, geographically, as South Hall, until it was in 1946 named for outgoing, longtime University President Nicholas Murray Butler**. “Discussions for a new library began in 1927 when the university librarian addressed a 13 page letter to President Butler proposing to build a new library by connecting Low Library to University Hall,” says WikiCU. (University Hall, which was never completed, was eventually razed for the construction of Uris. It’s oval shape is still reflected underground in that of the Marcellus Hartley Dodge Gymnasium.) When the University Hall extension was rejected, Butler contracted architect John Gamble Rogers to build the new library on the south edge of campus, on 114th Street. According to an article in the Columbia Daily Spectator‘s recently digitized archives (digitized through a partnership with Columbia University Libraries and now hosted on CUL servers), South Hall was officially dedicated on November 30, 1934. “John Buchan, a member of the House of Commons of the English Parliament and noted British publicist, will deliver the principle address,” Spec reported. Buchan was a trustee of a Harkness foundation, the reporter added. *According to the Bureau of Labor Statistics’ Consumer Price Index inflation calculator, in 2014 dollars Low Library cost $70,083,880.60. **As an aside: the fact that Butler went nameless for 12 years perhaps gives one hope that the newish Northwest Corner Building (before that the “Interdisciplinary Science Building,” and the “Northwest Science Building” still before that) might eventually get a real name. This entry was posted in Uncategorized and tagged Butler Library, Columbia, Low Library. Bookmark the permalink.